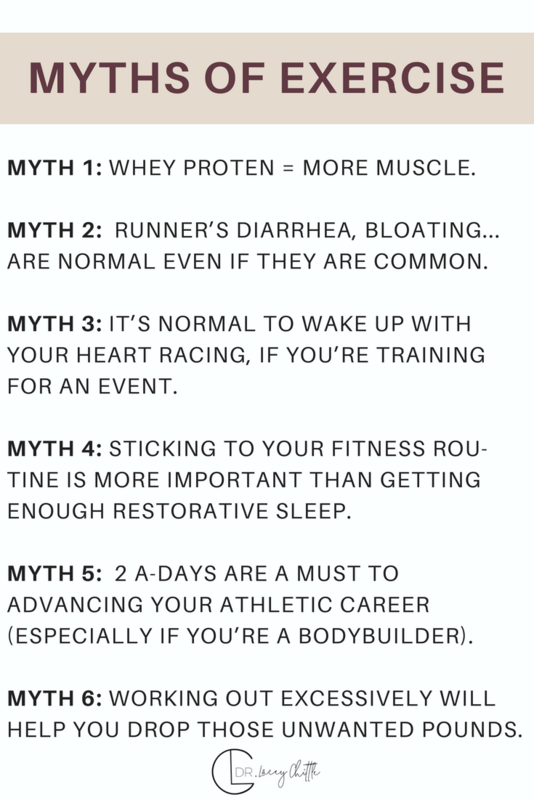 I believe there’s so many myths circulating in the fitness and running community and this misinformation can make it difficult for people to know “what” to do and even perpetuate / contribute to illness. I don’t think there’s ever an answer that’s a simple black & white answer you are looking for when you google or find a Pinterest pin that says this (even though I have a Doctorate in Physical Therapy). I practice personalized medicine, so I’m always personalizing ALL exercise to each and every one of my clients. I see this a lot in the fitness community. It’s easy to think that more protein = more muscle growth. However, too much protein can cause free radical damage which actually gives you the opposite effect than what you were looking for! Protein does not equal muscle! More protein isn’t always better for you either! So how much protein should you be having? There is a physiological limit! 3️⃣Adequate active vitamin B6, to carry amino acids into the bloodstream and to the cells for use. How much protein most people they can utilize and need for normal bodily processes to consume 1 gram per kg of body weight, but even then, sometimes we need to make it easier on their body by consuming it as bone broth, hydrolyzed collagen protein, fish, or meats cooked in liquids in a slow cooker or pressure cooker. Nuts, seeds, and legumes may need to be soaked or fermented to maximize the amino acids one can pull from them. That racing heart is NOT an indicator that you’re workout was “hard enough” for you. It actually means that you’ve overdone it and it’s causing stress on your adrenals and cortisol levels. When you have heart racing that wakes you, a little bit of excess cortisol was released. This may be due to impaired glucose handling (aka low blood sugar) causing the cortisol to be released. Or the amount of exercise you’ve done, is being perceived as yet another “stressors,” and robbing your adrenal glands of their reserves, causing dysregulation in the amount and timing of the cortisol release. However, this is NOT in your best interest. Sleep is critical for cellular repair and recovery. You may be better off taking the morning or day off and getting those extra hours of sleep to help your body recover and repair itself. It can be highly effective when all you are doing in between your two workouts is refueling with optimal nutrition, doing restorative practices and sleeping and resting your body. However, for the vast majority of us doing 2 a-days, this is not the case. In between my two a-days for a decade of my life I worked, I went to school, I studied, I trained others, I walked miles and miles, you get the idea. I didn’t rest and I did very little to fuel my body with proper nutrition. Honestly it’s kinda amazing I was able to do this for as long as I did. If you are not giving your body all the things it needs to recover from exercise eventually you will not recover from any of your exercise and you will not continue to make gains in your fitness. MYTH 6: Working out excessively will help you drop those unwanted pounds. You can also tap out your adrenals making your body “hold on” to that extra weight. And if you actually back off and either take a break or incorporate restorative exercise such as a gentle yoga class, tai chi, or walking, that extra weight you don’t like, it will literally fall off w/o effort when your hormones and digestion are back in balance. Which one of these myths was a surprise to you?